These fun and fabulous Spiral Socks have been donated to p/hop by the ever generous and talented designer Jane Lithgow. 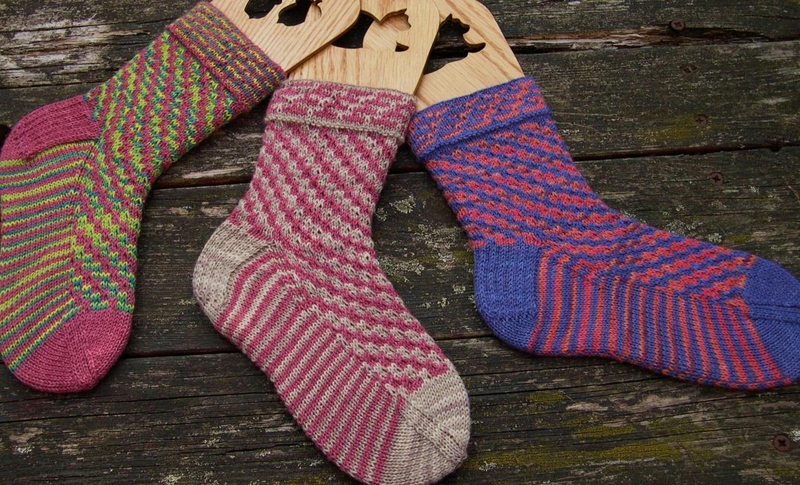 The cheerful pattern is made using slip stich which is an easier technique than fairisle, using only one working colour at a time, making them a great introduction to colourwork knitting. If you want to know what the cunning adjustment is you’ll just have to read the pattern. To see what others have made from this pattern, please visit the Spiral Socks pattern page on Ravelry. If you like this pattern you may be interested in Jane’s other designs for p/hop, the popular Cranford Mitts and colourful Karenina Socks. Browse our other great p/hop patterns here.